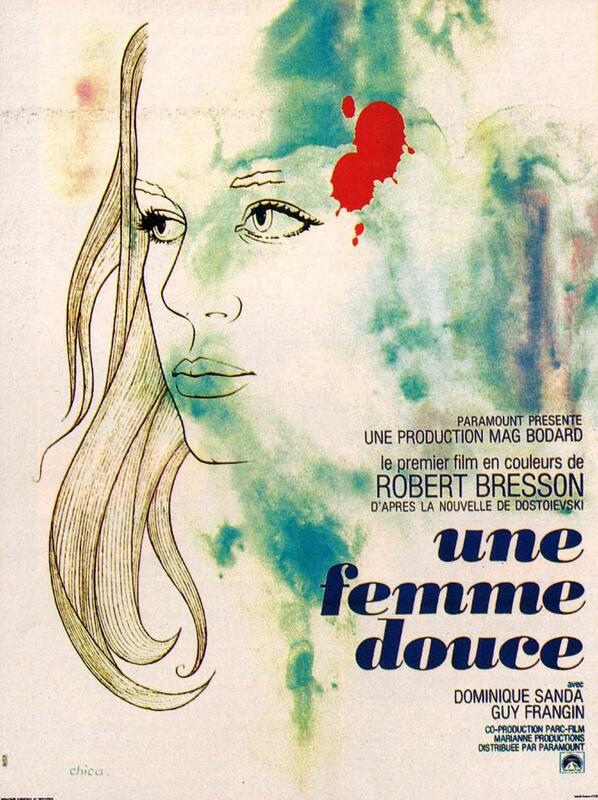 Une femme douce (English title: A Gentle Woman) is a 1969 French drama film directed by Robert Bresson. It is Bresson's first film in color, and adapted from Fyodor Dostoevsky's short story "A Gentle Creature (Кроткая)". The film was set in Paris at the time. The tragic drama is characterised by Bresson's well known ascetic style, without any dynamic sequences or professional actors' experienced and excessive expressions. Dominique Sanda, starred as "a gentle woman", made her debut in the film, starting her career as an actress. Bresson chose her just as a result of her first voice call. The film opens with a flowing curtain, implying a young woman's suicide. Her distraught husband explores in flashbacks what led her to kill herself. The story reveals their desperate, despairing miscommunication. Their dialogue only deepened her isolation and sadness. Although the film applies a background of 60s Paris, such as Muséum national d'histoire naturelle and Musée National d'Art Moderne, its theme is accurate to the novella. Bresson subsequently made another adaptation of Dostoevsky, his next film Quatre nuits d'un rêveur (Four Nights of a Dreamer) (1971) based on White Nights.